This page contains our latest reports for the higher and further education sectors. 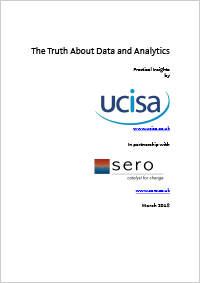 The truth about data and analytics is the result of a recent workshop of practitioners in this field who were prepared to share the truth about the challenges and the way of advancing data and analytics relevant to the HE sector. The workshop was hosted by UCISA and facilitated by Sero HE. Sero also works in the FE and training sector and has a lot of experience in use of learning technology across different parts of the sector. We recently undertook a short study on behalf of the Education and Training Foundation to explore the barriers to embedding learning technology in the delivery of teaching, learning and assessment in further education colleges. Interviews and focus groups were held in March 2018 in three FE colleges with senior managers, eLearning coordinators, curriculum managers and mainstream lecturers. The evidence from this study indicates that college senior leaders have a critical role to play in embedding learning technology in their organisations through developing, managing and implementing a digital strategy, which is linked equally to teaching and learning as well as to the demands of management information systems.